My dad retired as an Air Force colonel. I was born on Otis Air Force Base, Massachusetts, and he was in the military my entire growing-up period. We moved to Alabama, Denver, and then Florida, where I started the first grade. Second grade in South Carolina. Third, fourth, and fifth grades in Virginia, and sixth, seventh, and eighth grades in Wiesbaden, Germany. I used to ride the school bus with Priscilla Beaulieu. Elvis had just left Germany, and she was my big sister’s friend. We all lived in apartment buildings in the officers’quarters neighborhood. Priscilla’s family’s apartment was three buildings down, and she would come visit us. She and my sister tried out for cheerleading together and neither one made it. So who knows? If Priscilla had made the cheerleading squad, she may have never gone to Memphis to be with Elvis! I read an article on the disproportionate number of children who grow up in the military and later become actors. A lot of that is probably the amount of time you spend by yourself. Also, I think that if you’re not in a stable environment, you probably turn to yourself —reading, films —for entertainment. Sometimes I saw three movies a week at the American theater in Wiesbaden. Back then, television ran American shows, but they were dubbed in German. I would turn down the sound and try to read lips on My Three Sons. I’d listen to the radio, which also probably attributed to growing my imagination. We’d have soap operas, The Shadow. We’d have Top Sounds of the ’60s music once a week. The year we went to Germany was 1961. The Cuban Missile Crisis was going on, the Berlin Crisis. Every Sunday, we practiced the evacuation route to France in case World War III broke out. We had rations in the trunk of the car. I always had a backpack ready, and my parents always had to know where I was. It was a very intense situation. Years later, when I was in Israel for PM Magazine, the air raid sirens went off by mistake. I immediately got out of bed, grabbed my passport, and shot off down the hall looking for the air raid shelter. I didn’t even think; it was just a reflex reaction that was programmed into me when I was 11. My father was transferred to Memphis in 1964 and became deputy commander of the Defense Depot, which was a former prisoner of war camp. We lived in tiny quarters. The barbed wire slanted inward, and there were guards at the gate. When my friends from Central High School came to see me, they had to stop at the gate! I graduated from the University of Tennessee at Knoxville, came back to Memphis, and went to law school before I escaped that. I really didn’t want to go into law, but it sounded so practical. I knew I shouldn’t have pursued it when I fell asleep during orientation! I’ll never forget it; they were talking about water rights! That part of the brain isn’t my favorite. Jackie Nichols at Playhouse on the Square is the reason I went into television and film commission work. I wanted to be an actress, but he wouldn’t cast me —with good reason! I accepted a television internship at Channel 10, and they offered to finance my master’s practicum, a 30-minute documentary on Tennessee Williams. So I ended up with a master’s in radio/television/film. I went back to Germany to work at a cultural center at Elmau Castle for three months, then came home. At Channel 5, I was the staff announcer, had a little game show on in the afternoon, and reviewed movies on Wake-Up Call. I had to take it. I became a member of the first Memphis television crew to be sent on assignment overseas. I went to work at the film commission in Nashville because I thought that would be a great segue into the film industry. It was a big political deal with a lot of infighting, and I didn’t like it. When I got a call from Memphis asking me to head Memphis’s film commission, I said, “No!”But I was really homesick, and they said the political environment wouldn’t be the same. I thought, “I’ll take it for a year.”Well, one year turned into 22. Since then, I’ve had the honor of helping Memphis step into the national spotlight for television, film, and movie productions. The Firm was our first major breakthrough in 1993, followed by an array of movies, films, and productions that include Great Balls of Fire!, The People vs. Larry Flynt, Walk the Line, and innumerable network MTV, NBC, CBS, and cable and international television productions. Now, this all sounds great, but you’re looking at a person who focused mainly on work. I didn’t have the responsibilities of rearing children, for instance, so I could work as much as I wanted in a career that I love. That makes a difference. I’ve always said that yes, I’m driving the van, but without an incredible amount of support, that van wouldn’t have gasoline to go anywhere! A career in the movie business is for those who are strong —no, not just strong, but tough —physically, mentally, spiritually. And preferably for those who have additional, steady sources of income. My bonnet is tipped to them! I have never stopped wanting to achieve more in all areas of my life. I wouldn’t be where I am if my parents hadn’t encouraged me to have a career and supported me always in good times and not-so-good times. 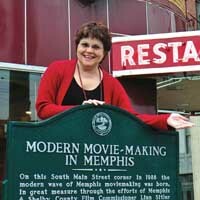 People don’t realize that we had to work to get the Grisham films to Memphis. For example, we almost lost The Firm to Chicago. I’ll never forget the first day of filming on Great Balls of Fire! Seeing a crane on Union Avenue during rush hour traffic and all these cars piled up —because the drivers were watching the filming and each had run into the car ahead! (I quietly crept back to the office.) Also, the first day of filming The Firm. I was peering through the hedges behind Herbie O’Mell’s house and saw a neighbor bringing her dog to the set (a definite no-no because of the barking). This same neighbor saw the craft service table and exclaimed, “Oh, look! They even set out snacks for us!”She proceeded to take her dog to the table and eat the crew’s snacks! (Again, I quietly crept back to the office.) To this day, I don’t know who this woman was, and I surely hope she doesn’t read this article! Success is finding pride and contentment in your work, your family, your home, your spirituality. The actor who impressed me most was Ginnifer Goodwin. She is so genuine and down to earth, yet very talented and very acclaimed. I know her mother, Linda Goodwin, and in this case, the apple fell right under the tree! As a military kid we did have a different growing-up experience. My first teacher was black. I always went to integrated schools when I went to military schools or lived in military neighborhoods. I didn’t think anything of it at all; that was just part of it. So I have a different perspective. If I could meet one person it would be Abraham Lincoln. My biggest fear is getting lost and staying lost. I am directionally dyslexic. My father was totally a self-made man and very driven. When I was growing up, he went to night school so he could graduate from the University of Pittsburgh. He received a battlefield commission when he was 22 or 23 years old. I get my work ethic and drive from my father. From my mother, I get my manners and kind attitude toward people. The most difficult thing was when Dad became terminally ill. There are no original …oh, I’ve found lots of original people and ideas! I was very lucky in that even though being a military child was a middle-class existence, I could enjoy many benefits of someone from a much wealthier background. For instance, while in Germany, we’d go to Paris for Easter. When I moved back to Memphis, no one at Central High School had gone to Paris for Easter! But for us, it was like a Memphis kid going to Hot Springs, Arkansas. Movie actors tend to overly impress people. It’s not the actors’ fault —people want to be impressed. I still have good friends that I made in law school. I think it’s because your first year in law school is like Vietnam! It’s so horrible and hideous that you bond. And it’s especially horrible and hideous when you don’t really know why you’re doing it except you wanted to try it! Why do something just because it’s practical? The greatest joy is being needed by someone you love and having that person allow you to help him or her. One of the worst days in my life was when we closed the Hernando DeSoto Bridge for Francis Ford Coppola’s The Rainmaker. He wanted to film a scene on that bridge. We arranged with the Tennessee Department of Transportation for traffic to be re-routed to the “old”bridge. The Arkansas film commission also arranged with the Arkansas DOT to have that be the detour bridge. At some point into the filming, Arkansas started doing construction on the old bridge, creating a five-hour backup on both bridges. The next day, the Commercial Appeal called the movie “The Painmaker.” It made national news; children on school buses couldn’t go to the bathroom, and on and on. Then, the scene didn’t even make it into the movie after all of that! I will never again ask to close the Hernando DeSoto Bridge for a movie! In college I had suitemates from Tullahoma, Tennessee. They had that degree of stability from growing up in a small town their entire lives. It seemed they had a security that military kids can only dream about, a calm confidence and self-esteem of knowing who you are and where you belong. They weren’t practicing evacuations every Sunday; they were going to the park. Not that I’m complaining at all, mind you. My experiences have given me a very textured life. The most important lesson I’ve learned is how unselfish and generous certain people in local and state government can be in helping with film commission work. Whenever I feel like hurrying someone off, I try to remember how much help I’ve received. The film commission would not be where it is today without these people who were happy to help and expected no credit. All you need in life is your God, good health for yourself and those you love, a good attitude, a good heart, and a good paycheck. I want to be remembered …Hmmm!!! I haven’t thought about this yet. IS IT THAT TIME? My final 2 cents is that we all are basically alike. We just seem different because we make different choices. And some of us —like our parents, grandparents, and great-grandparents —didn’t have the opportunity to make choices others did.